Ek Tha Tiger promo views causes jam on YouTube! To say that the promo for the upcoming Salman Khan-starrer, Ek Tha Tiger received a positive response is actually an understatement. Without giving away too much of the storyline, the trailer is full of “dushoom dushoom”. We know that the Yash Raj Films production tells the story about intelligence agencies of India and Pakistan and revolves around the story of an agent, Tiger whose character is portrayed by Salman. The teaser received thousands of hits on YouTube and also became the trending topic on Twitter, following its release on Thursday. The film fraternity, including critics and trade analysts have been raving about the upcoming film. Today Feels like 1of those days where I wanna speak my mind ! 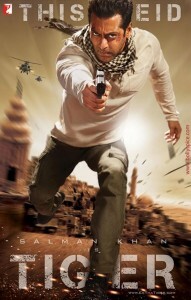 On a positive note saw the trailor of EK THA TIGER n Omg ! Salman Rocksss !!! Director, Kabir Khan who also has Kabul Express and New York under his belt is certainly beaming with the response to the teaser. According to Khan, it jammed the YouTube view meter within three minutes of its launch and caused the YRF server to be in danger of crashing. The film, which also stars Katrina Kaif, is set to release this Eid. 19 queries in 0.658 seconds.